How it works: Our auto-updating software is designed to work with Windows 7-10 32 and 64 bit. Sequence Designer gives you the ability to create your own animations, simulate them on your computer, and generate a file to re-program your sequencer. You can customize everything in the software including LED arrangement, channel assignment, LED color, and what happens for all of the 12v inputs (parking, turn signal, brake, car on/off, show mode). Please watch the 2017 tutorial below for a brief overview on how the software works. The software works with a few different kinds of files; the main 2 are Project files (.GLP) and Hex files (.HEX). 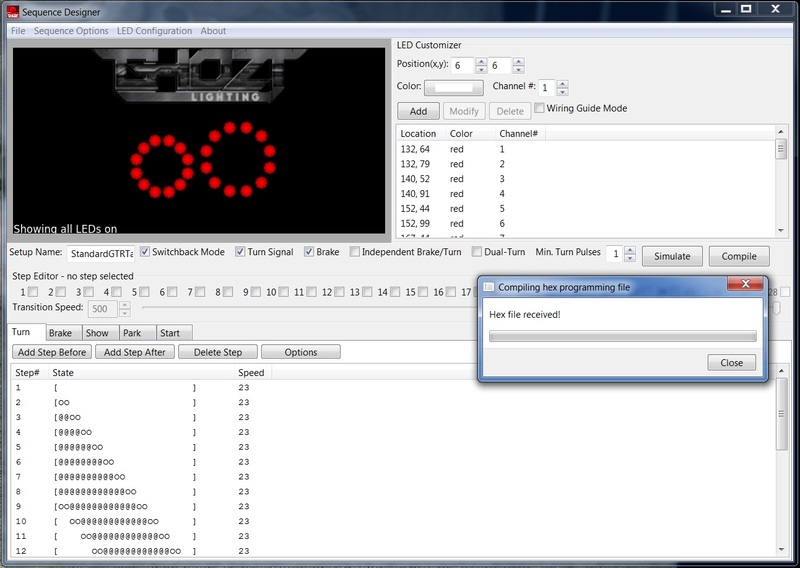 Project files include your LED arrangement, and all animations for various functions and are what you save/open with Sequence Designer. The Hex file is the file created by Sequence Designer when you click Compile, that is used in the MPLab software to re-program the sequencer. 3. Open an existing project in the Projects folder, found in the Sequence Designer application folder, to play with and see how the software works.